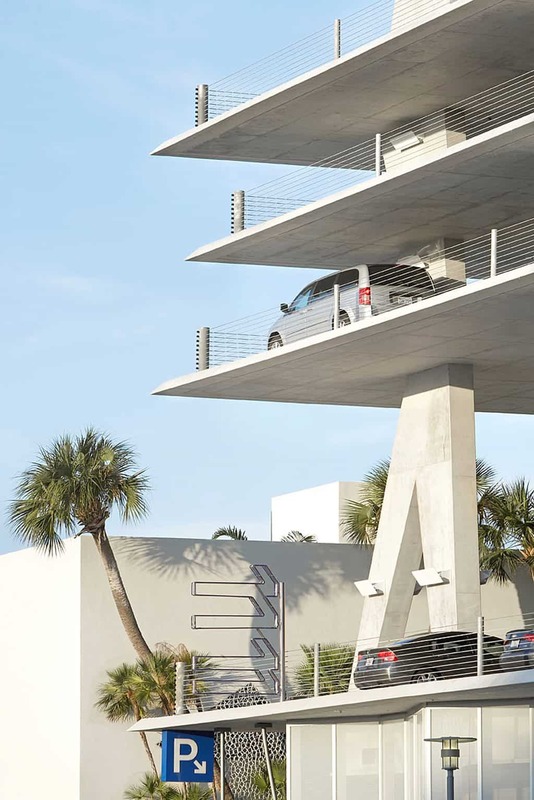 At Lincoln Road, Robert Wennett, a private real estate developer and art collector, had the desire to solve a critical urban problem in Miami Beach – parking. Having 20 years worth of experience in real estate, Wennett was looking to create a ‘civic building’ that was just not for commercial profit, but one that would also be a fitting legacy he could leave behind. After interviewing a slew of architects, he enlisted the Swiss architectural practice, Herzog & de Meuron, to take up the task of reinventing the quintessential parking garage into an entity that would both be identifiable and accessible to local residents – one that would stir up the social ambience in Miami. The result was 1111 Lincoln Road, a mixed urban development project planned on four parcels of land. First, the existing building, a brutalist structure from the Cold War era, that housed the Suntrust Bank; was renewed to accommodate retail programs. Wennett insists that “Great architecture comes out of the quirkiness of the site,” and that the juxtaposition of the old and new can add to the richness of the spirit of a place. Secondly, the star of the project: a concrete monolith of parking, retail and a private residence; was attached to the Suntrust building. And finally, a two-story building with the relocated bank on the ground floor and inward-looking residential units on its upper floor was designed. The centrepiece of 1111 Lincoln Road is indisputably the car park. To design it, Herzog & de Meuron studied the context of Miami Beach – a place teeming with life and a dynamic urban experience. The easy route would have been to design a standard parking garage atop a retail base, with a skin that hid the apparent ‘ugliness’ of the vehicles; and a recessed penthouse on the topmost floor. But that would have been an insult to the lush complexities of the everyday social synergies along Lincoln Road. Instead, the design team was inspired to create a contrast of the existing ‘opaque’ Suntrust building by envisioning an open concrete structure. Miami comes with its fair share of facades; so to have a building draw its identity by being unabashedly naked, is such a welcome reprieve that immediately sets it apart. The skeletal structure of the design lends it a timeless quality: it seems like it’s still under construction while remaining undeniably ostentatious at the same time. The parking garage comes in plates with varying floor to ceiling heights. It is these double and triple volume spaces that let the building breathe and enables its to be more than just a parking garage. This vision has seen 1111 Lincoln Road host dinner parties, wine tastings, photo shoots, concerts and even weddings. Far from being solely utilitarian – it is a car park with a soul! Here, the structure is the architecture. A mosaic of floor plates, jutting Vs and slanting columns, together with connecting ramps create the eventual ensemble. The seemingly haphazard placement of these elements was actually driven by complex site and building code forces. An unenclosed structural stair in the centre of the building enables the pedestrian circulation within the garage to be a rewarding and panoramic experience. It is this apparent expansion and contraction of space as one accesses the various levels; as wells as the broad vistas of the surrounding coastal landscape that adds to the intrigue and layering of an insatiable curiosity. In a sense there was a deliberate intention to get rid of everything about parking garages that people hate: low ceilings, overhead lights, narrow ramps, ugly pipes and sprinklers. In fact, all directional signs are placed on the ground, leaving the overhead surfaces uncluttered and distraction-free. It is this intentionality that brought on board Wolff Olins, the brand consultancy behind the Tate Modern’s and 2012 London Olympics brand. For 1111 Lincoln Road, a subtle and understated signage design was opted for, leaving the building as honest as it could be. The entirety of 1111 Lincoln Road was recently sold to Bayerische Versorgungskammer, a German investment fund, for a sum in the region of $283 million. Considering that Robert Wennett bought the property for $23.5 million in 2005 and developed it with a combined cost of $65 million; it goes without saying that there is a hefty premium that comes with good design. It is safe to say that Herzog & de Meuron have succeeded in creating a building that is in motion – one that twists one’s senses, simultaneously presenting multiple perspectives – a truly unique milieu in Miami Beach. MEP & HVAC: Franyie Engineers, Inc. Contractor: G.T. McDonald Enterprises, Inc.